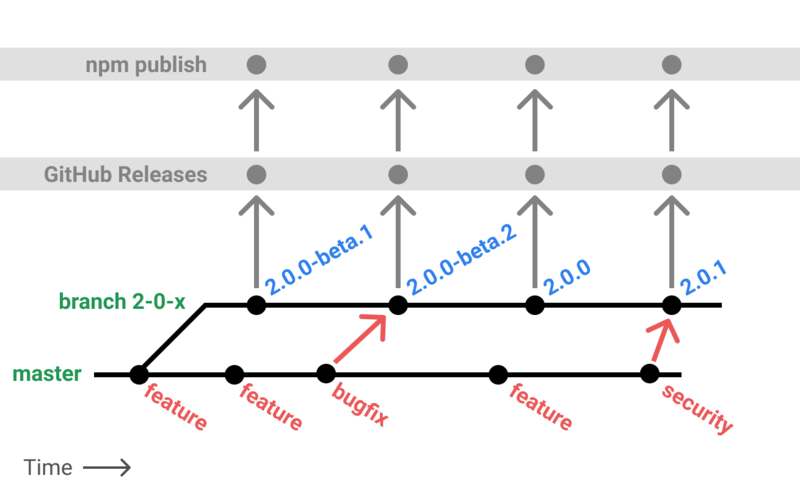 A detailed look at our versioning policy and implementation. 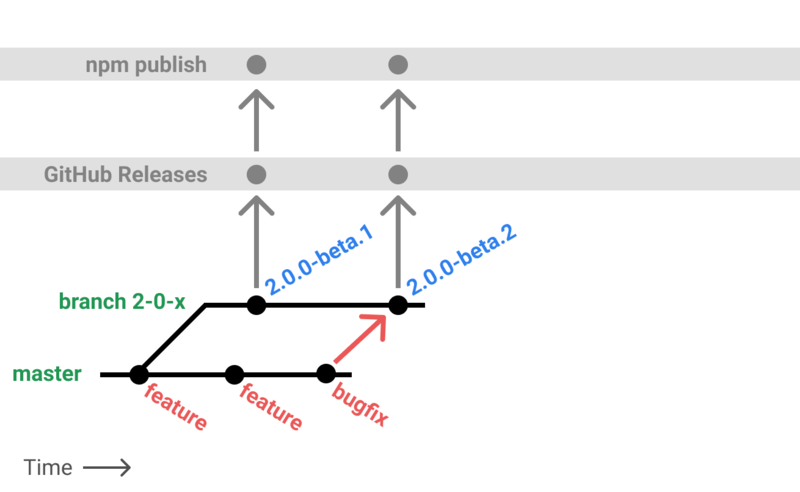 Electron versions < 2.0 did not conform to the semver spec: major versions corresponded to end-user API changes, minor versions corresponded to Chromium major releases, and patch versions corresponded to new features and bug fixes. While convenient for developers merging features, it creates problems for developers of client-facing applications. The QA testing cycles of major apps like Slack, Stride, Teams, Skype, VS Code, Atom, and Desktop can be lengthy and stability is a highly desired outcome. There is a high risk in adopting new features while trying to absorb bug fixes. An app developed with 1.8.1 cannot take the 1.8.3 bug fix without either absorbing the 1.8.2 feature, or by backporting the fix and maintaining a new release line. There are several major changes from our 1.x strategy outlined below. Each change is intended to satisfy the needs and priorities of developers/maintainers and app developers. We will cover in detail how git branching works, how npm tagging works, what developers should expect to see, and how one can backport changes. From 2.0 onward, Electron will follow semver. Below is a table explicitly mapping types of changes to their corresponding category of semver (e.g. Major, Minor, Patch). Note that most Chromium updates will be considered breaking. Fixes that can be backported will likely be cherry-picked as patches. Stabilization branches are branches that run parallel to master, taking in only cherry-picked commits that are related to security or stability. These branches are never merged back to master. Stabilization branches are always either major or minor version lines, and named against the following template $MAJOR-$MINOR-x e.g. 2-0-x. We allow for multiple stabilization branches to exist simultaneously, and intend to support at least two in parallel at all times, backporting security fixes as necessary. Older lines will not be supported by GitHub, but other groups can take ownership and backport stability and security fixes on their own. We discourage this, but recognize that it makes life easier for many app developers. Use ~2.0.0 to admit only stability or security related fixes to your 2.0.0 release. Use ^2.0.0 to admit non-breaking reasonably stable feature work as well as security and bug fixes. What’s important about the second point is that apps using ^ should still be able to expect a reasonable level of stability. To accomplish this, semver allows for a pre-release identifier to indicate a particular version is not yet safe or stable. Whatever you choose, you will periodically have to bump the version in your package.json as breaking changes are a fact of Chromium life. The risk to meeting our stability timeline must be low. If allowed changes need to be made once a release is beta, they are applied and the prerelease tag is incremented, e.g. 2.0.0-beta.2. 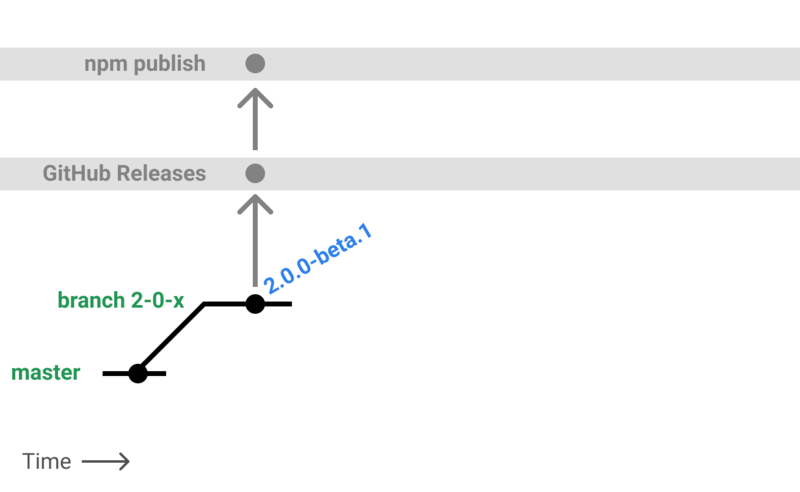 If a particular beta release is generally regarded as stable, it will be re-released as a stable build, changing only the version information. e.g. 2.0.0. After the first stable, all changes must be backwards-compatible bug or security fixes. If future bug fixes or security patches need to be made once a release is stable, they are applied and the patch version is incremented e.g. 2.0.1. 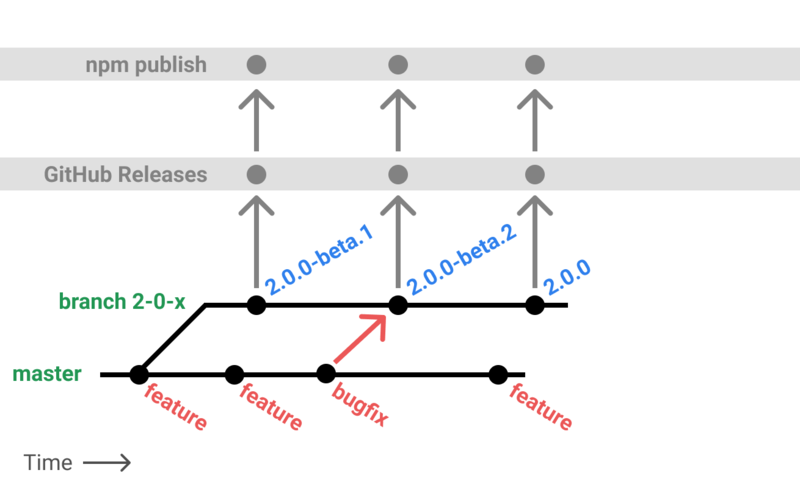 Admitting feature-flagged changes, that do not otherwise alter existing code paths, at most points in the beta cycle is okay. Users can explicitly enable those flags in their apps. Admitting features of any sort very late in the beta cycle is  without a very good reason. A new release branch is created that includes the latest set of features. It is published as 2.0.0-beta.1. A bug fix comes into master that can be backported to the release branch. The patch is applied, and a new beta is published as 2.0.0-beta.2. The beta is considered generally stable and it is published again as a non-beta under 2.0.0. Later, a zero-day exploit is revealed and a fix is applied to master. 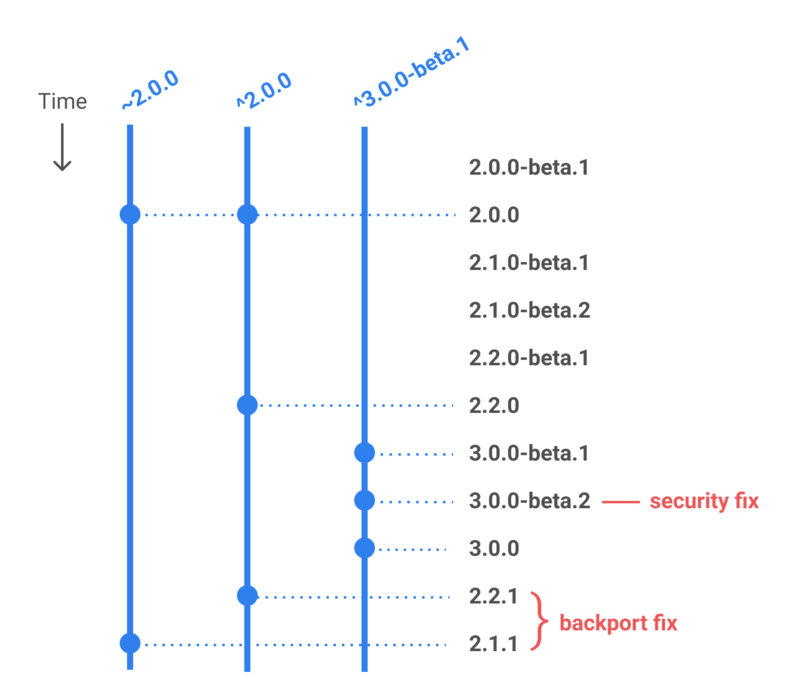 We backport the fix to the 2-0-x line and release 2.0.1. Our strategy has a few tradeoffs, which for now we feel are appropriate. Most importantly that new features in master may take a while before reaching a stable release line. If you want to try a new feature immediately, you will have to build Electron yourself. Commits that would result in a semver major bump must start their body with BREAKING CHANGE:. Commits that would result in a semver minor bump must start with feat:. Commits that would result in a semver patch bump must start with fix:. We allow squashing of commits, provided that the squashed message adheres the the above message format. It is acceptable for some commits in a pull request to not include a semantic prefix, as long as the pull request title contains a meaningful encompassing semantic message.